Download "STUDENT LOAN DEFAULT MANAGEMENT SERVICES AGREEMENT Between. and HARRISBURG AREA COMMUNITY COLLEGE"
1 STUDENT LOAN DEFAULT MANAGEMENT SERVICES AGREEMENT Between and HARRISBURG AREA COMMUNITY COLLEGE This Agreement is made between Harrisburg Area Community College (HACC), whose primary address is One HACC Drive, Harrisburg, PA and (Contractor), whose address is, is made and entered into for the Contractor to provide services as stipulated below on the Terms and Conditions set forth. 1) Facilities Covered: Harrisburg Area Community College 2) Statement of Work: The Contractor hereby agrees to furnish and provide appropriate supervision, labor, material, tools and all other items necessary to perform the services herein specified and described in RFP14-06 Student Loan Default Management Services. 3) Purchase Order: All authorizations for the Contractor s Services will be issued by HACC to the Contractor in the form of a Purchase Order which will incorporate the Agreement by reference. All Purchase Orders issued shall be subject to the Terms and Conditions set forth in this Agreement and any special Terms and Conditions which may be included in a Purchase Order; in the event any general terms and conditions provided with a Purchase Order conflict with any Terms and Conditions in the Agreement, the Terms and Conditions of this Agreement shall prevail. 4) Term of Agreement: The initial term of this Agreement shall be in effect during the rejuvenation process unless terminated earlier as set forth in this Agreement. 5) Payment Terms and Changes: The payment for services to be provided by the Contractor will be detailed in the assigned purchase order and paid within thirty (30) days. All invoices must be mailed to Accounts Payable Department, at One HACC Drive, Harrisburg, PA Invoices must be descriptively itemized and must clearly indicate the applicable HACC Purchase Order number, including the Project Name and Location as well as the HACC account number, and must be submitted at the time of project completion before payment can be authorized. 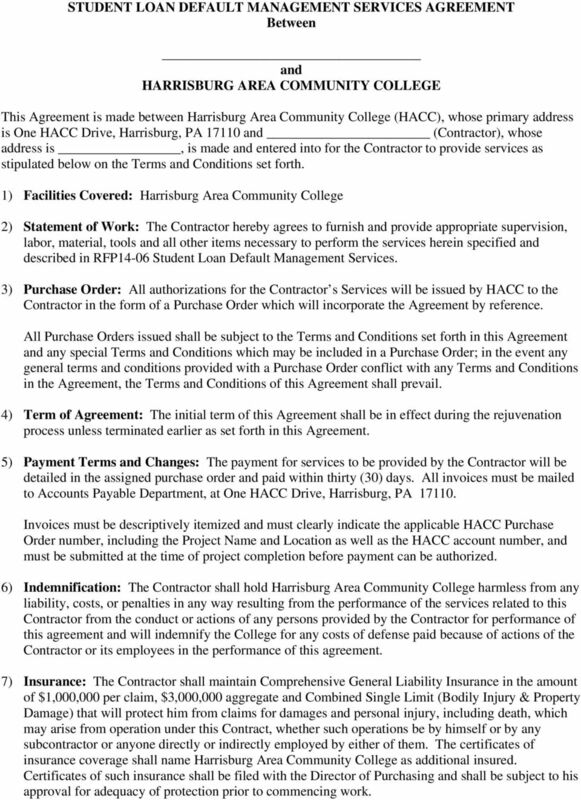 6) Indemnification: The Contractor shall hold Harrisburg Area Community College harmless from any liability, costs, or penalties in any way resulting from the performance of the services related to this Contractor from the conduct or actions of any persons provided by the Contractor for performance of this agreement and will indemnify the College for any costs of defense paid because of actions of the Contractor or its employees in the performance of this agreement. 7) Insurance: The Contractor shall maintain Comprehensive General Liability Insurance in the amount of $1,000,000 per claim, $3,000,000 aggregate and Combined Single Limit (Bodily Injury & Property Damage) that will protect him from claims for damages and personal injury, including death, which may arise from operation under this Contract, whether such operations be by himself or by any subcontractor or anyone directly or indirectly employed by either of them. The certificates of insurance coverage shall name Harrisburg Area Community College as additional insured. Certificates of such insurance shall be filed with the Director of Purchasing and shall be subject to his approval for adequacy of protection prior to commencing work. 2 Pennsylvania Law requires that the Contractor shall provide statutory worker's compensation insurance for employees. The Contractor shall also require the same insurance when the work is to be performed by a subcontractor. Certificates of such insurance shall be filed with the Harrisburg Area Community College s Director of Purchasing prior to commencing work. 8) Force Majeure: Neither party to this Agreement will be liable to the other for any failure or delay in performance under this Agreement due circumstances beyond its reasonable control including, without limitation, Acts of God, accident, labor disruption, acts, omissions and defaults of third parties, and official governmental and judicial action not the fault of the party failing or delaying in performance. 9) Conduct on HACC s Property: The Contractor shall at all times maintain good order among its employees and persons brought upon HACC s premises. The Contractor shall confine its employees and all other persons who come onto HACC s premises at Contractor s request or for reasons relating to this Agreement, and its equipment, to that portion of HACC s premises where the work under this Agreement is to be performed, and to roads and gates leading to and from such sites, and to any other area which HACC may designate, and shall comply with all HACC s vehicle and security regulations. The Contractor must be issued ID Badges or sign in an out at the security desk whenever performing work upon HACC s premises. 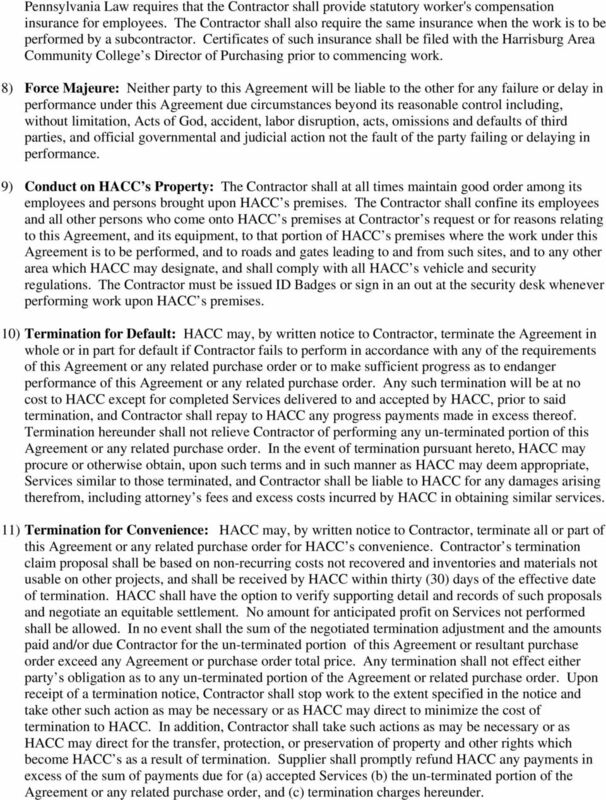 10) Termination for Default: HACC may, by written notice to Contractor, terminate the Agreement in whole or in part for default if Contractor fails to perform in accordance with any of the requirements of this Agreement or any related purchase order or to make sufficient progress as to endanger performance of this Agreement or any related purchase order. Any such termination will be at no cost to HACC except for completed Services delivered to and accepted by HACC, prior to said termination, and Contractor shall repay to HACC any progress payments made in excess thereof. Termination hereunder shall not relieve Contractor of performing any un-terminated portion of this Agreement or any related purchase order. 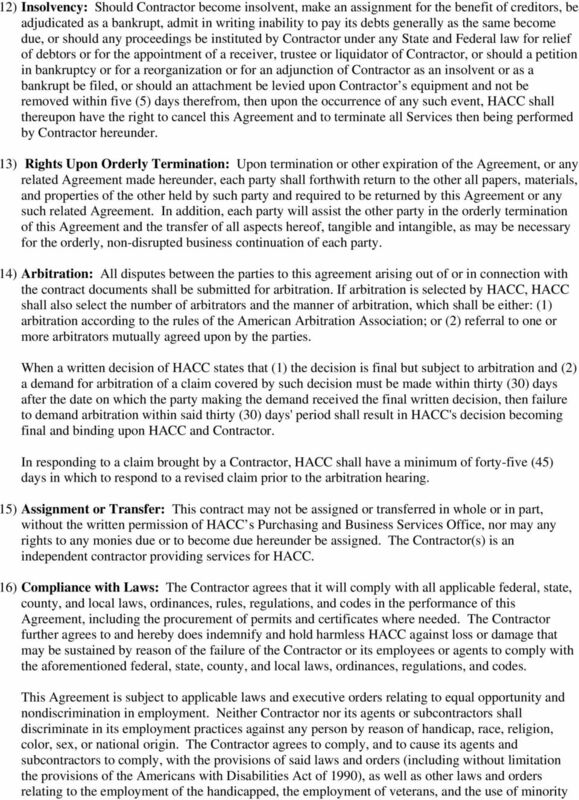 In the event of termination pursuant hereto, HACC may procure or otherwise obtain, upon such terms and in such manner as HACC may deem appropriate, Services similar to those terminated, and Contractor shall be liable to HACC for any damages arising therefrom, including attorney s fees and excess costs incurred by HACC in obtaining similar services. 11) Termination for Convenience: HACC may, by written notice to Contractor, terminate all or part of this Agreement or any related purchase order for HACC s convenience. Contractor s termination claim proposal shall be based on non-recurring costs not recovered and inventories and materials not usable on other projects, and shall be received by HACC within thirty (30) days of the effective date of termination. HACC shall have the option to verify supporting detail and records of such proposals and negotiate an equitable settlement. No amount for anticipated profit on Services not performed shall be allowed. In no event shall the sum of the negotiated termination adjustment and the amounts paid and/or due Contractor for the un-terminated portion of this Agreement or resultant purchase order exceed any Agreement or purchase order total price. Any termination shall not effect either party s obligation as to any un-terminated portion of the Agreement or related purchase order. Upon receipt of a termination notice, Contractor shall stop work to the extent specified in the notice and take other such action as may be necessary or as HACC may direct to minimize the cost of termination to HACC. In addition, Contractor shall take such actions as may be necessary or as HACC may direct for the transfer, protection, or preservation of property and other rights which become HACC s as a result of termination. Supplier shall promptly refund HACC any payments in excess of the sum of payments due for (a) accepted Services (b) the un-terminated portion of the Agreement or any related purchase order, and (c) termination charges hereunder. 4 business enterprises, to the extent any such laws and others are applicable in the performance of work or furnishing or services, materials or supplies hereunder. For this purpose, the provisions of such laws and orders and pertinent regulations issued thereunder shall be deemed an integral part of this Agreement to the same extent as if written at length herein. 17) Equal Opportunity and Non-Discrimination: Harrisburg Area Community College is committed to providing opportunities for woman and minority owned businesses. Harrisburg Area Community College encourages WMBE s to participate in the bidding process but does not grant special status to WMBE s when making procurement decisions. Harrisburg Area Community College is committed to non-discrimination and equal employment opportunity. 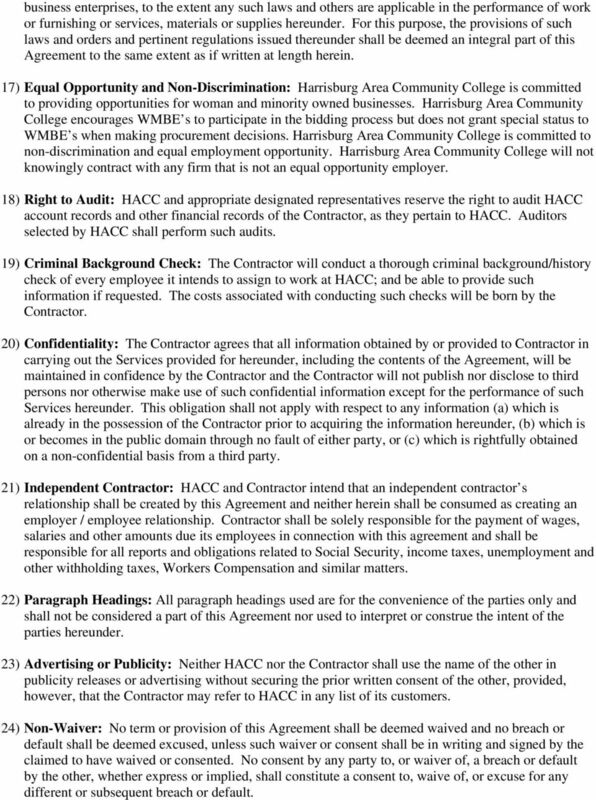 Harrisburg Area Community College will not knowingly contract with any firm that is not an equal opportunity employer. 18) Right to Audit: HACC and appropriate designated representatives reserve the right to audit HACC account records and other financial records of the Contractor, as they pertain to HACC. Auditors selected by HACC shall perform such audits. 19) Criminal Background Check: The Contractor will conduct a thorough criminal background/history check of every employee it intends to assign to work at HACC; and be able to provide such information if requested. The costs associated with conducting such checks will be born by the Contractor. 20) Confidentiality: The Contractor agrees that all information obtained by or provided to Contractor in carrying out the Services provided for hereunder, including the contents of the Agreement, will be maintained in confidence by the Contractor and the Contractor will not publish nor disclose to third persons nor otherwise make use of such confidential information except for the performance of such Services hereunder. This obligation shall not apply with respect to any information (a) which is already in the possession of the Contractor prior to acquiring the information hereunder, (b) which is or becomes in the public domain through no fault of either party, or (c) which is rightfully obtained on a non-confidential basis from a third party. 21) Independent Contractor: HACC and Contractor intend that an independent contractor s relationship shall be created by this Agreement and neither herein shall be consumed as creating an employer / employee relationship. Contractor shall be solely responsible for the payment of wages, salaries and other amounts due its employees in connection with this agreement and shall be responsible for all reports and obligations related to Social Security, income taxes, unemployment and other withholding taxes, Workers Compensation and similar matters. 22) Paragraph Headings: All paragraph headings used are for the convenience of the parties only and shall not be considered a part of this Agreement nor used to interpret or construe the intent of the parties hereunder. 23) Advertising or Publicity: Neither HACC nor the Contractor shall use the name of the other in publicity releases or advertising without securing the prior written consent of the other, provided, however, that the Contractor may refer to HACC in any list of its customers. 24) Non-Waiver: No term or provision of this Agreement shall be deemed waived and no breach or default shall be deemed excused, unless such waiver or consent shall be in writing and signed by the claimed to have waived or consented. No consent by any party to, or waiver of, a breach or default by the other, whether express or implied, shall constitute a consent to, waive of, or excuse for any different or subsequent breach or default. PERFORMING ARTIST AGREEMENT., ( Artist ). TERMS AND CONDITIONS FOR QUOTATIONS. As stated herein, seller is Environ Laboratories, LLC and purchaser is the recipient of the quotation. MASTER AGREEMENT FOR CONSULTING SERVICES (INSERT NAME OF FIRM) THIS AGREEMENT is made and entered into as of the day of by and between South Tahoe Public Utility District, hereinafter referred to as "DISTRICT"